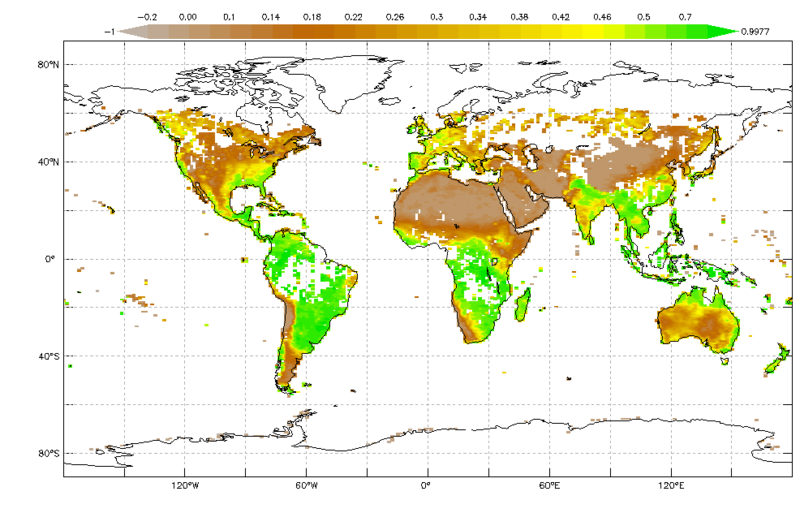 The colors on these maps show a measure of the "greenness" of Earth's landscapes. The values on these maps—ranging from -0.1 to 0.9—have no unit. 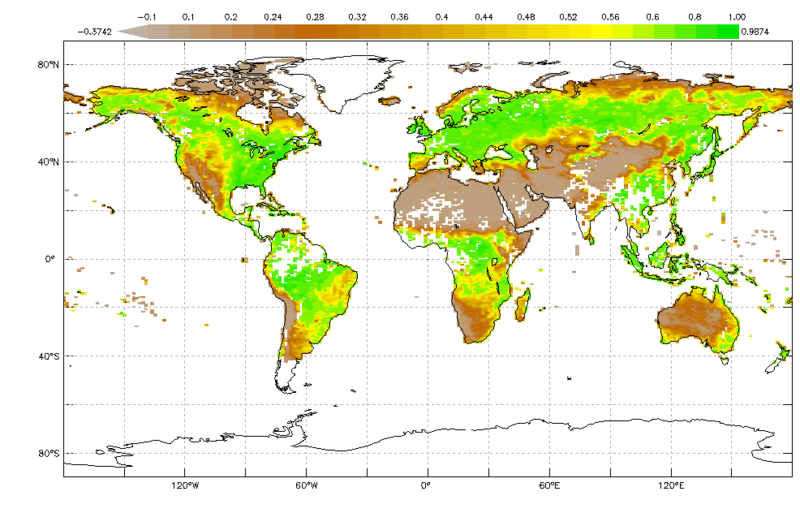 Rather, they are index values in which higher values (0.4 to 0.9) show lands covered by green, leafy vegetation and lower values (0 to 0.4) show lands where there is little or no vegetation. As can be seen through a prism, many different wavelengths make up the spectrum of sunlight. When sunlight shines on objects, certain wavelengths are absorbed and other wavelengths are reflected. The pigment in plant leaves—chlorophyll—strongly absorbs visible light for use in photosynthesis. The cell structure of the leaves, on the other hand, strongly reflects near-infrared light. The more leaves a plant has, the more these wavelengths of light are affected. 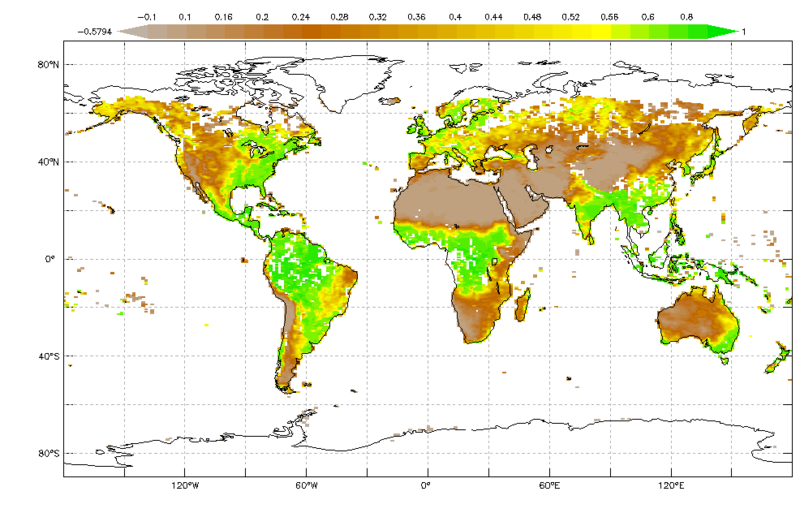 Scientists exploit this knowledge of plants' interactions with light to map the density of green vegetation across Earth's landscapes by designing satellite sensors to measure the wavelengths of red and near-infrared light that is absorbed and reflected by plants all over the world. Subtracting plants' reflectance of red light from near-infrared light and then dividing that difference by the addition of the red and near-infrared light reflected produces a resulting value that scientists call Normalized Difference Vegetation Index (NDVI). 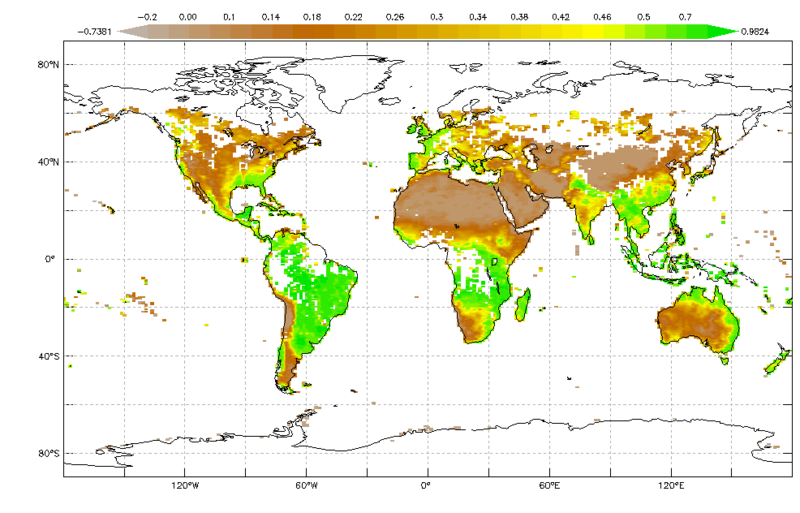 The NDVI maps shown here were made using data collected by the Moderate Resolution Imaging Spectroradiometer (MODIS) aboard NASA's Terra satellite. Plants are sensitive to their environment and so they serve as a good indicator whenever there is a change. Scientists routinely produce global NDVI maps to help them monitor and investigate shifts in plant growth patterns that occur in response to climate changes, environmental changes, and changes caused by humans. Farmers and resource managers also use NDVI maps to help them monitor the health of our forests and croplands. So these maps are used both for scientific research as well as societal benefit. Goal: Students observe seasonal images of Monthly Normalized Difference Vegetation, looking for any changes in vegetation that are occurring throughout the year. Have students work together to predict the best arrangement of the images by putting them in (what they believe to be) chronological order.